Our research team has identified over 100 patents filed in the last 12 months address what is sure to be the future of sunglasses, goggles and the everyday shades. Based on technology and the evolution of eyewear our research believes that a digitally enhanced lens may not only provide for different uses, colors, and applications but very well could include corrective adjustments required by the wearer. Such a device could be set at the factory and shipped to the consumer, or designed to use a blue tooth connection to an application that would allow for corrective and environmental settings. 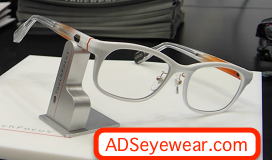 One thing is crystal clear the eyewear market is ripe for disruption and the question is who will be the big winners? The researchers at ADSeyewear.com will continue to work alongside CheckBiotech to ensure our readers are up to date on the latest in Liquid Crystal Sunglasses.